Wine Opener,Red Wine Beer Bottle Opener Wing Corkscrew for Wine Enthusiast Waiters Bartenders by Cute by cute at Verve Wine Bar. MPN: F07-06212-0-SR/WLLA-LYW. Hurry! Limited time offer. Offer valid only while supplies last. This easy to wash Waiter Corkscrew and Wine stopper set is constructed from zinc alloy body and stainless steel corkscrew for strength and flexibility, the black anti-slip touch panels brings comfort and easy open. Ideal for any restaurant, bar, or home for a romantic evening or just a casual drink. Buy a solid heavy duty and built to last wine corkscrew as a great hostess gift for your families or good friends. 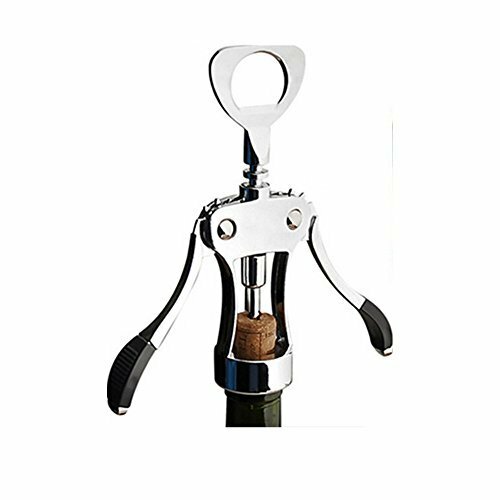 Removes corks in a single lifting action of the strong and ergo dynamic steel handle. Suitable for everyone and brilliant for those that struggle with older dificult to operate corkscrews. Silver Wine Bottle Opener will add a level of elegance to your kitchen or bar area, that will make you proud when it's time to pop the cork on a new bottle! If you have any questions about this product by cute, contact us by completing and submitting the form below. If you are looking for a specif part number, please include it with your message.